Matt was in a dirt bike accident on Friday, Jan 5th 2019. Matt was initially treated in St George where he had 2 surgeries. The first was for his compound leg fracture with rods placed from knee to ankle. On Saturday, he had back surgery with fusion of 5 vertebrae which included 10 screws and 2 rods in his upper back. He also has some broken ribs and chipped teeth. He was released to Acute Rehab for intense therapy at Utah Valley Regional in Provo on Jan 11th, and will be there for up to 5 weeks for rehab before he can come home. Many people have asked how they can help. 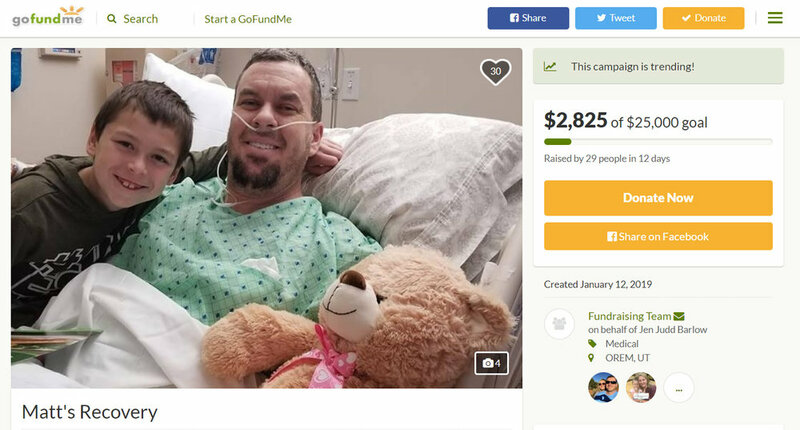 Your monetary donation will help with medical bills and other expenses that will continue to come due as he is off work. Also, your continued prayers for Matt and his family are appreciated.